Nearly 125 years ago, the serial killer known as Jack the Ripper terrorized London. Authorities never established his true identity despite dozens of speculative theories. But what if Jack discovered he had a son who had survived his mother’s brutal murder? What if the boy somehow ended up in a New York orphanage with no knowledge of his origin? And what if that boy is taken in by the world famous Pinkerton detective agency as a trainee? That’s the premise of this highly entertaining novel for young adults. It’s 1895 in New York City. Fourteen-year-old Carver Young grew up in an orphanage reading crime novels and dreaming of becoming a detective. He is pitifully poor with little education, so when the orphanage must ‘release’ its older children due to overcrowding, Carver’s future prospects look dim indeed. Before he leaves the orphanage, Carver breaks into the adoption records hidden in the attic to look for clues about his parents. His file is empty except for one mysterious letter written in coarse black handwriting that Carver decides must be from his father. The boy tucks the letter in his pocket and forgets about it for the time being. Carver’s friend Delia has written to the New York Times about securing a position as a journalist, so Carver writes to the New York City Police Commissioner, Teddy Roosevelt, asking if he can join the force and learn to be a detective. At the last adoption event before the orphanage closes, a bright young pair of reporters with the Times adopts Delia. A wealthy couple adopts Carver’s friend Finn because they want a nice-looking boy to appear with them in photographs of their charitable events. And a man named Albert Hawking takes on Carver as his ward so he can teach Carver about detecting. The boy’s letter to Roosevelt fell into Hawking’s hands and he believes Carver shows real promise. Hawking takes Carver to the secret Pinkerton headquarters which lie beneath the streets of New York City. The headquarters fill an underground hall so large that a train is required to cross the huge space. Carver’s mentor Hawking gives him the run of the place so he can look for information about his biological father. But Carver soon finds himself in the middle of a real investigation: tracking down a killer who has begun to prey on wealthy New York socialites. Carver teams up with Delia and Finn to search for his father and to investigate the ongoing murders. It doesn’t take Carver long to realize that his father and the murderer may be the same man! Using the vast resources of the Pinkerton library, City Hall, and the Times, the trio makes remarkable progress in their investigation. The discovery that Carver’s father might be Jack the Ripper horrifies him. Surely he is nothing like the man, the monster who murders helpless women! But things get worse when Carver’s loyalties are tested. 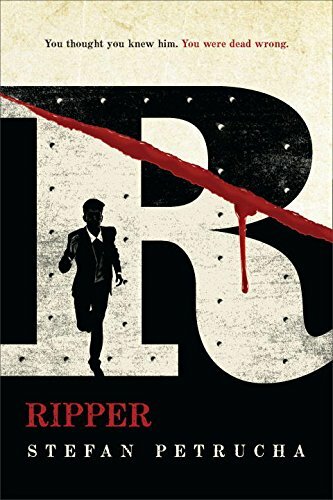 Is Jack the Ripper a stranger to him or someone he knows? A Pinkerton detective? One of the corrupt officials in the police department that Roosevelt is trying to clean up? Mr. Petrucha does an admirable job of making the time and place come to life using evocative details. We see a New York City where orphans who are not adopted live on the street or make meager livings selling newspapers. A city where new-fangled automobiles still scare horses. A place where the distance between abject poverty and upper society cannot be bridged. New York City itself is a character, balanced between the modern world and the Victorian era, much as Carver is balanced between childhood and manhood. The story careens along from the very beginning to the last page. Ripper is filled with action, engaging dialogue, likeable characters, and a bevy of steampunk gadgets sure to appeal to the mechanically and technologically leaning. Ripper is hard to put down—so prepare yourself for a few scary nights.